Labor Day has passed, neighborhood community pools are closing and it is time to start thinking about preparing your landscaping for fall in Atlanta. The official start of fall may not be until September 22nd this year but the passing of Labor Day is acknowledged by most people as the symbolic end of summer. Remove faded flower heads from Crape Myrtles. 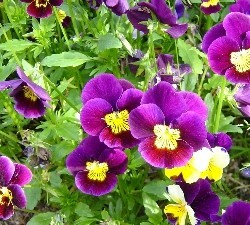 When it comes to fall color, the most popular hardy annual installed in Atlanta landscaping and in fact all of Georgia continues to be the pansy. Most are planted in the fall and produce some flowers in fall and winter followed by peak flowering in spring. They can be either a single color, ­or two to three colors with a face. The variety of colors include black, purple, lavender, blue, yellow, bronze, apricot, orange, maho­gany, red and white. Other commonly known annuals to plant in the fall include Baby’s Breath, Larkspur and Snapdragons. Our team of professionals can also suggest additional fall annuals whose name may not be as commonly known as those above but can make a great addition to your landscaping. Hutcheson Horticultural is here to assist you with any of your September or year round landscaping needs. From seasonal trimmings and cleanups to installation of seasonal color we do it all and would love to speak to you about your landscaping needs. You can reach us via phone at 770-924-1001 or use the “Contact Us” feature on our website.